- Waste water pumping and transport. 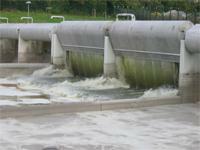 - Domestic and industrial waste water treatment. GRUP ROMET involves in all stages of your project: preliminary analysis, identification of technical solution, equipments production, installation, commissioning, training and service. The GRB-SBR waste water treatment plants are used for the treatment of the waste waters coming from the unitary or separate sewerage networks, as well as for the treatment of the industrial waste waters or for the waste waters that can be biologically treated. These waste water treatment plants are used for capacities ranging between 500 - 10000 equivalent persons (PE), and are based on SBR technology. Therefore they can be easily adapted to the specificity and to the waste water quantity of each application. Pressure drainage systems imply a special sewage technology, suitable mainly for residential areas, leisure parks or outside cities, with unfavorable topography conditions, high level ground water or difficult soil conditions. With a remarkable experience in waste water treatment, GRUP ROMET is concerned with environment protection, focusing on waste water recycling safe discharge in natural emissaries (rivers, lakes). GRUP ROMET supplies a large range of pumps of various parameters. Thanks to the external adjustable cutter for crushing usual additions from domestic waste water, the submersible pumps provide highest safety.